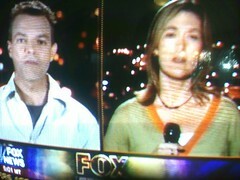 I’m not happy to hear that my favorite news personality Shepard Smith is over in Lebanon, dodging rockets. Rookie journalists are made to stand on the shore during hurricanes, with their goggles and hats blowing off, staggering around while trying to shout “As… you can see… WHOA! Very… Windy here…” They get paid next to nothing, and work insane hours. After they claw their way up the journalistic totem pole, they get rewarded with fame, prime time, good pay and… ROCKET DODGING!